It is our privilege to be the recipient of the 2018 Consumer Choice Award for the best Calgary Maid Service - House Cleaning Services for the 15th year in a row. We thank our clients and Calgary for their tremendous support and confidence. We are very proud of our accomplishments! A Maid for a Day has been honored with the prestigious "Consumer Choice Award" for business excellence in Calgary. This is our 15th consecutive year winning the Award for the best Calgary Maid Service. 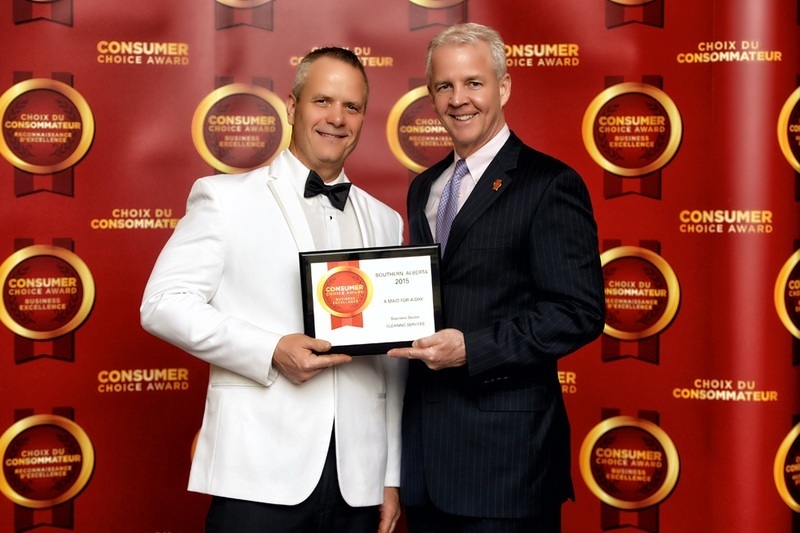 The "Consumer Choice Award" is considered a seal of excellence. For recipients, the award not only constitutes the crowning achievement of their efforts, but more importantly it represents the most valuable reward of all, the knowledge that they have earned the trust and loyalty of consumers. A Maid for a Day has received the Readers' Choice Award 8 times for the #1 choice in Calgary House Cleaning, and Maid services. Since 1993, the Calgary Herald has asked readers annually to vote for their favorites in a range of categories. We consider the Readers' Choice Awards one of each year's most important and significant projects, and we hope our advertisers and readers do, too. A Maid for a Day has received the Top Choice Award 5 times for the top choice in Calgary Cleaning Services. The Top Choice Award's goal is to provide customers with an excellent source of reliable products and services, and replace what many experts call "Businesses' unfounded claims of superiority" with something real and meaningful. A Maid For A Day is an accredited member of The Better Business Bureau and we are very proud to carry an A+ Rating. A Maid For A Day received the Longstanding Accreditation Award in 2015 for Trust, Performance and Integrity. "Reliability & Trust - For more than 27 years, A Maid For A Day has lived by these words"
"A Maid For A Day understands the different needs of clients"
"Household chores put on hold for a day"
"A Maid For A Day has been giving its clients clean houses, spare time and peace of mind for more than two decades"
"Cleaning service puts clients first"
"Maid to order - Want to hire one?"